Setting foot on Cox's Bazar Beach in Bangladesh, I couldn't help but stare. I saw men in business suits on cell phones, women in burkas piled three and four to a beach chair, wandering cows, feuding dogs, street children hawking sea shells, pirate ship-like fishing boats and agonizingly loud roars of fuel-spewing speed boats roaring through crowds in knee-deep water. And, when I set my surf board down on this bizarre beach, a few dozen people crowded around and stared back. It was more than uncomfortable. How would I surf among all these gawking people in these polluted waters for TWO WHOLE WEEKS? I shivered as I made my way into the chilly grey ocean, with regretful why-did-I-come-here thoughts accompanying my every step. The surrounding streets were filled with images one might expect from Bangladesh: men on rickety bicycles transporting entire families, shoeless children, dilapidated homes, garbage littered sidewalks, roadways and fields. But in the midst of all this, is a group of girls who defy stereotypes. They're street kids who, against the backdrop of their conservative Muslim culture, have learned how to surf. Nasima, 16, first stood on a board when she was 8 and can now trump the boys in surf competitions. She was introduced to the sport while selling shells on the beach to support her family and now glides over waves with the ease of a pro and the intensity of a survivor. "I had a lot of critics telling me that surfing wasn't for good for girls in Bangladesh," she told me through a translator. "My parents said why do you go surfing, you'll die in the ocean." Gulapsha, 12, has a fiery passion for surfing and, despite being half the width of her surfboard, jumps up on and falls off it with the same level of enthusiasm. She lost her father but is the only one of the five surfer girls who is in school; this is thanks to a brother who peddles shells on the beach to pay her tuition. "People say bad things about me because I'm so little and I'm going surfing," she said. "I tell them it makes me happy." I came to Bangladesh to do a short film on these girls for Storytellers for Good. I was accompanied by videographer Ted Allen and Farhana Huq, founder of Brown Girl Surf, a project to share stories of trailblazing female surfers around the globe. Our first glimpse into the barriers these girls face came when we arrived at the humble stone home Nasima shares with her 19-year-old husband and his family. Her husband would give her permission to interview with us only if she left the house covered head to toe in a burka. The next day when Farhana distributed full-body-covering surf suits for all the girls, she heard someone banging on her door yelling "Khaarab! Khaarab!" ("Bad! Bad!"). It was Nasima's husband, who had followed this wife to the beach and Farhana's room. He told his young wife she could only wear the form-fitting suit with a dress over it. "If I was rich no one would mind that I surf," Nasima had told me just the day before, "but because I'm poor people are saying bad things." "These girls are taking risks everyday in a culture where doing something like this is just not accepted," commented Farhana. The half-Bangldeshi, half-Pakistani surfer is a bit of an anomaly herself. A commanding 5'8" with boisterous long curly black hair, Farhana looks nothing like the petite blond surfer from Orange County that first taught her how to surf as her Bangladeshi father watched on. "He watched me struggling and told me, saaaarfing ees for yoooung boyees," Farhana recalled mimicking her father's Bengali accent. "You have to be acroooobaaatic!!! It's noooot for you." 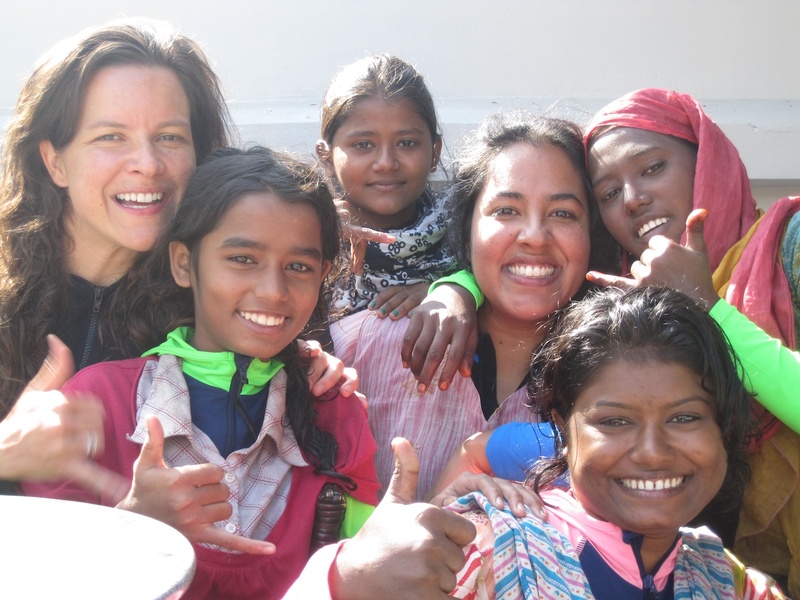 Farhana hopes that through surfing the Bangldeshi girls and others will learn to face life challenges even bigger than the waves they stand on. "Surfing has taught me you can re-pattern what's possible for you and discover things you never thought you knew." I usually leave countries like Bangladesh the day after my shoots wrap up. On this trip, as I stayed on an extra week to surf with the girls, I found that the storyteller in me kept wanting to find a happier ending for them. I wanted to send them to school. To stop any man from controlling them or looking at them disapprovingly for surfing. To halt the development that was robbing them of the once pristine but now smog and clutter filled Cox's Bazar shoreline. But as I watched these street kids yelp and holler while exchanging surfing hand gestures in the water, happily paddle for both the biggest and the tiniest of waves, and surf without a hint of self-pity in their style, it struck me that perhaps they didn't need my happy ending. Despite all the obstacles, they had already found at least one place where they are free.